When we moved to the Valley of the Sun, I was a new mom with a 9 month old and a 3 year old. 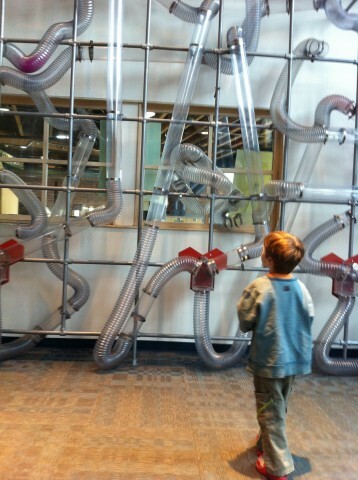 One of the best thing I did for my sanity was buy a membership to the fabulous Children’s Museum of Phoenix. In the 3 years since I moved here the membership doesn’t discount that much. They have a few times a year when it drops in price a bit. Around Thanksgiving and Christmas, some car dealerships will offer free admission if you drop off canned goods. And on the First Friday of the month in 2012 the museum is free from 5PM to 9PM. What can you expect from a visit to the Museum? Some of the exhibits are fixed, while others rotate. In the atrium there is the magnificent 50 ton 37 foot Climber. Both my boys love it, and as a parent, I can position myself nearby and keep my eye on them both the whole time. The museum is 3 stories of fun, the building is a former school and the classrooms are now exhibit spaces. There is a model grocery store and restaurant perfect for playing pretend. Lots of beans and grains to sift, spices to sniff and packages to carry back and forth on conveyor belts and check outs. The ballroom is a favorite with my older boy, and served as the inspiration for a ball drop at our house (that he has played with like twice since we built it, but you know how that goes). My younger boy loves the Noodle Forest, the race car track/car wash area. You can put on a smock and get dirty painting or doing crafts. If you can, come around noon. The museum slows down at lunch as most people come in the morning and head home for nap time. The museum closes periodically to change exhibits so check the website and verify they are open before you come down. I’ve pulled in on a Monday or in the Fall to discover it was closed. The race track/car area is hazardous for toddlers as they will stick their faces and hands near the track and can get hurt. Best to avoid that area until they outgrow that stage. I’m Impressed Fact: the Museum has a great policy for adults unaccompanied by children, they band adults and have great systems in place for monitoring and ensuring child safety. How do I know this? They have clipboards hanging on the wall with emergency plans and policies and I read it because I read everything I can find. There are loads of helpers in lime green shirts stationed everywhere to engage your child in play and keep everything peaceful. I love their focus on play and safety. A very special place! The gift shop has a great selection of unusual toys. A gift certificate to the museum makes a great gift. I haven’t ever done more than visit the museum and go straight home. Is there a family friendly restaurant you like or another attraction that you recommend to extend this outing?